Technology always helps the nation to defend the borders but this time the Ola, a most popular transportation app has helped the Indian ex-servicemen in some different way. They have partnered with Kendriya Sainik Board, New Delhi (India) to raise awareness to mobilize funds for Armed Forces Flag Day (AFFD). The campaign was propelled by the Defence Ministry and it going to run in multiple cities of India to raise fund from December 1 to December 7, 2017. Ex-servicemen, those are with Ola as driver partner and operators were congratulate as brand ambassadors for Ola’s contribution towards AFFD. As ambassadors, Ola Sainiks will be engaging with fellow driver partners and Ola customers sensitising them about Armed Forces Flag Day. As part of the fundraising drive, Ola employees have also, pledged contributions for the AFFD Fund. Furthermore, Ola’s driver partners are extending their contributions to the cause. They will be donating through donation boxes set up at the driver attachment centers across 10 states. 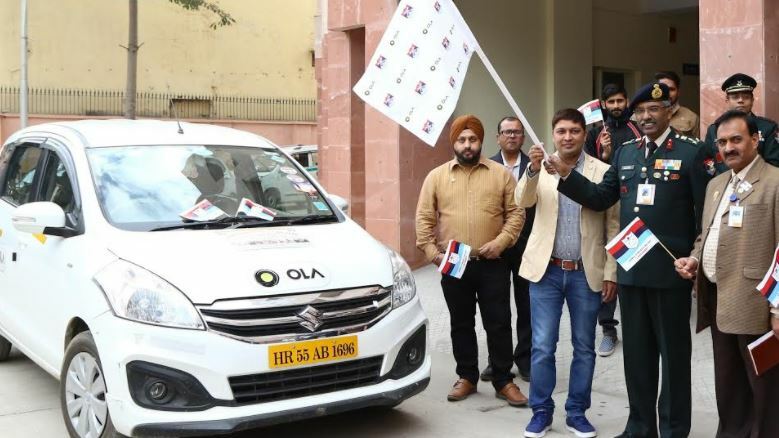 Ola is also distributing Armed Forces Flags to the general public visiting Ola Kiosks across major cities, urging customers to contribute to the fund during the week-long campaign.